I wake up rather early. The night has been unexpectedly cold here in Lamayuru. The month of July is considered the hottest month in Ladakh. Even then, the night was appreciably chilly. It must be getting really freezing here in later months, I wonder. Fortunately there is electrical power available at this time. I put on the electric water boiler and enjoy the luxury of a really hot water bath. After a rather sumptuous breakfast, I am ready for the return journey to Leh. I find that our driver and the car missing again. I get absolutely peeved now with this character. 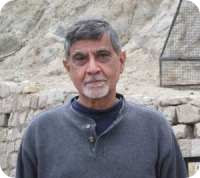 I telephone my travel agent in Leh and request him to help me. Within 15 minutes, the driver makes an appearance. Obviously, he has just woken up from his sleep. I would have to wait till he is ready. After ages, we are ready to leave. I try to discuss with the driver, plan for today. He is not very co-operative. Finally another person, who is a representative of my travel agent, appears on the scene. He has a lengthy discussion with the driver and finally the matter is settled. We would visit four places of interest on our way back to Leh. By now I am so irritated with this driver, that I decide to dump him later. I would have to take on, another driver from tomorrow. The return journey is quite uneventful and equally beautiful, till we reach town of Saspol on the Indus. Here we cross Indus, once again on a steel bridge built by army engineers and take a much smaller road to a village called Alchi. The village of Alchi is located on the left bank of the Indus, about seven kilometers south of town of Saspol and is named as a model village. Compared to Lamayuru, this village has dwellings, shops and other places, which look modern and have rather neat and clean appearance. 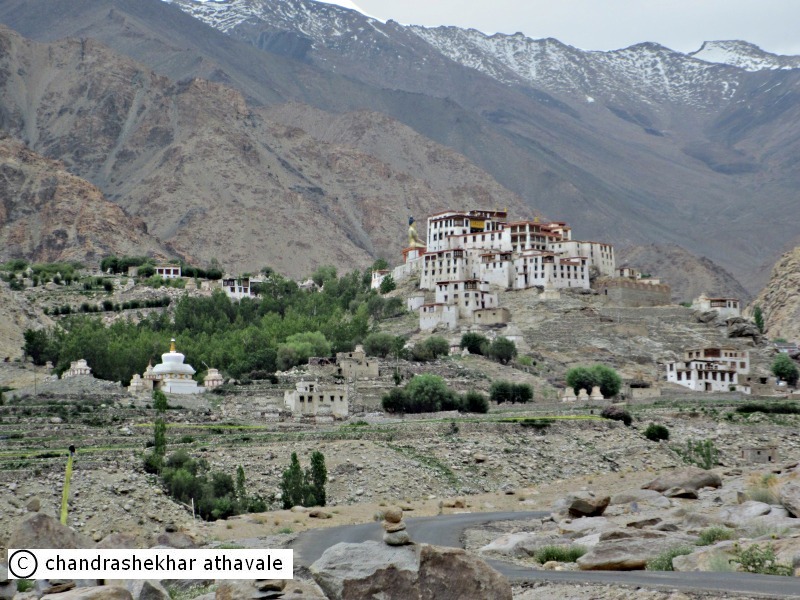 The village has a monastery which is known as Dhrma Wheel Monastery and was built in eleventh or twelfth century. Surprisingly, this monastery is not built up on a steep mountain slope, but is built on a stone outcrop downhill looking towards the Indus river bed. Our car stops in the town square. Besides other tourist vans and mini buses, I find some medium sized trucks being loaded and unloaded. The way to monastery is through rows of antique shops, selling everything that tourists might be interested. 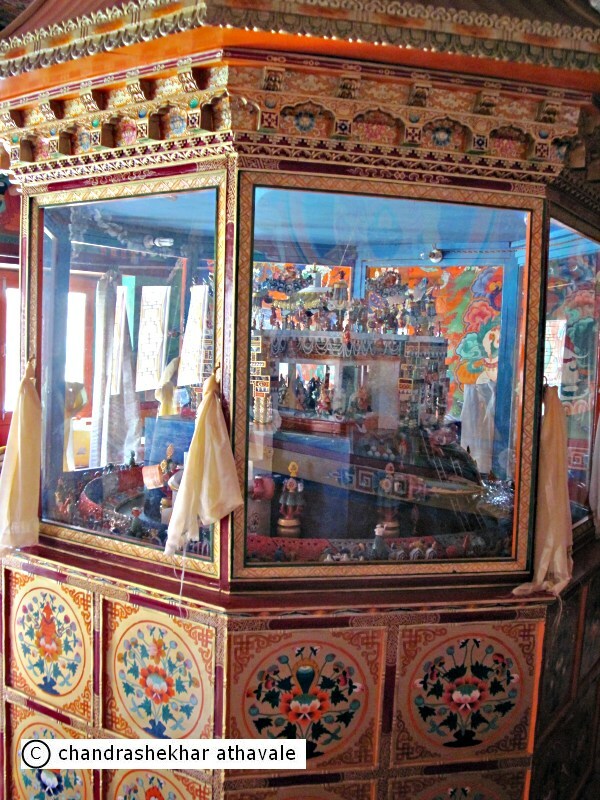 There are wooden engravings and idols, brass, silver and copper embossed and engraved jewelery, bead necklaces, Tibetan antiques, pictures, banners and even Buddhist prayer wheels. The prices are ridiculously high. I just gaze around and walk through. An open water channel has been built on the side of the path, with continuous flow of fresh mountain water flowing downhill. Anyone, who needs fresh water, can just dip a plastic pipe at an appropriate point and take the delivery of the water down stream. Very interesting water supply scheme for the village. 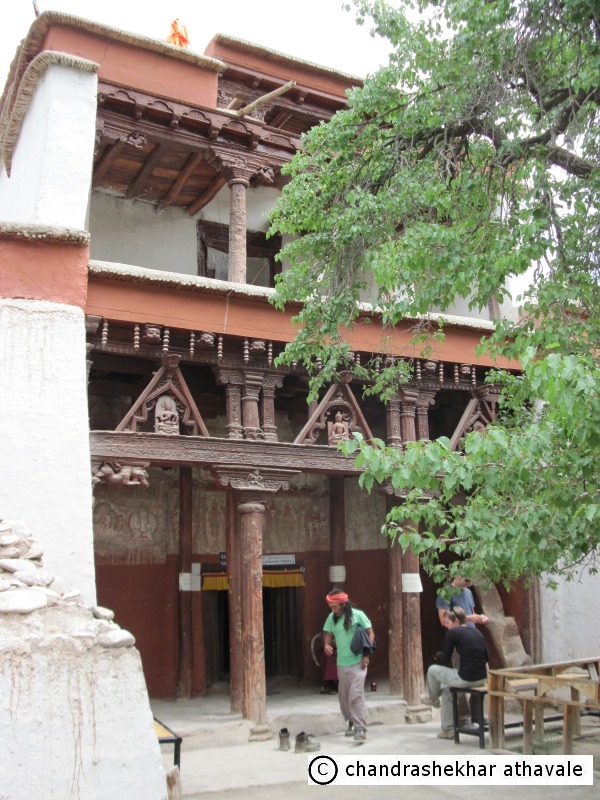 Alchi Monastery was founded by the same Rinchen Zangpo, who also founded the Lamayuru monastery, after he arrived in Ladakh from Kashmir. It was built by artisans from Kashmir and has a strong influence of Indian and Kashmir architecture. This Monastery, which initially followed the Ka-dam-pa order of the Mahayan Buddhism, consists of series of small squarish temples one after another going into northerly direction towards the river from the village. 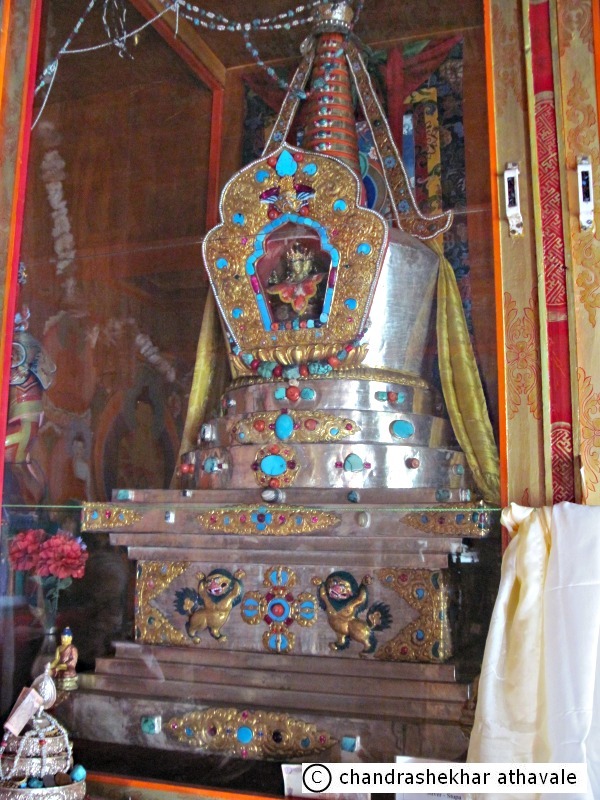 The first temple is called ‘Soma Lekhang’ and is a very small temple with a Stupa. There is not much to see here. I walk down on the stone paved steps to an old triple storied dwelling, which turnes out to be the Sumtsek temple. 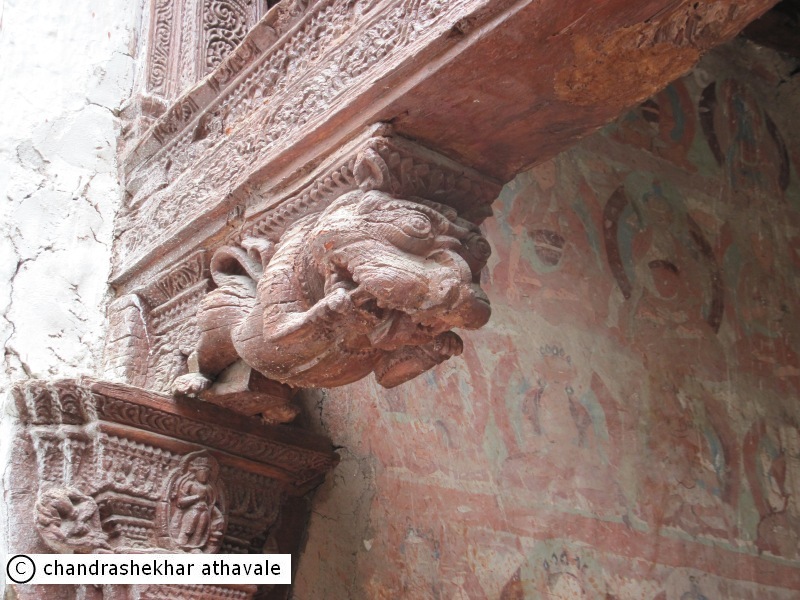 This temple has thousand year old carved wooden facade, consisting of pillars, carved brackets, and capitals, typical pre-Islamic architecture of Kashmir. There is no way to climb up to upper stories of the temple. In the center of the temple, there is a large stupa. 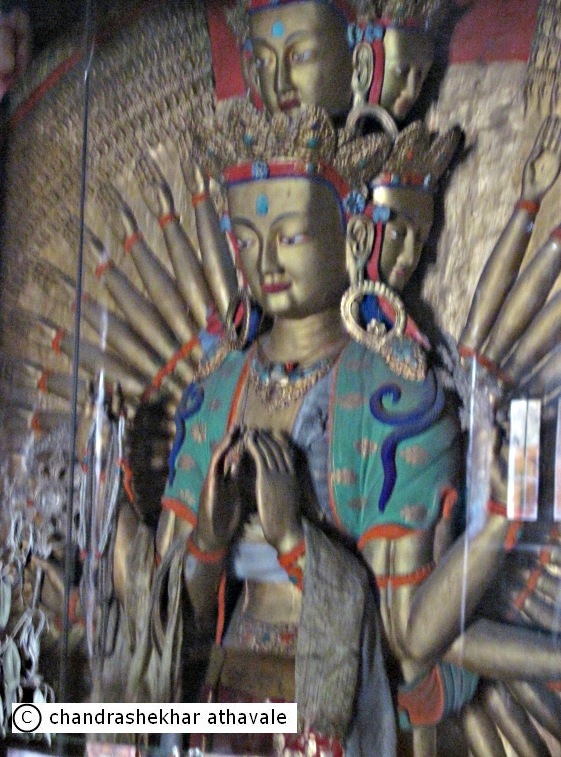 Three sidewalls have recesses in which large statues of Maitreya, Avalokitesvara and Manjusri are displayed. 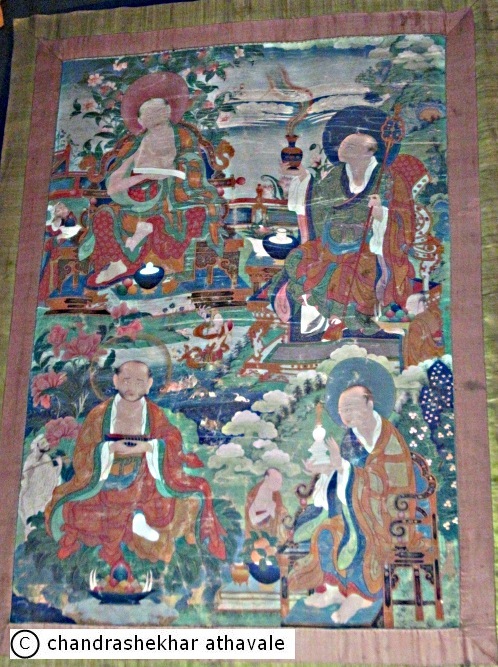 Rest of the walls are painted with figures of deities. The upper floors have an opening at the center in such a way that the sun light filters through to ground level. I walk further down the stone steps. In the front, there is an open courtyard with small buildings on left and in front. The building ahead, is some sort of a kitchen with cooking going on. I am offered Tea by two Lamas. On the left, there are two temples of Lotsa and Manjushri. 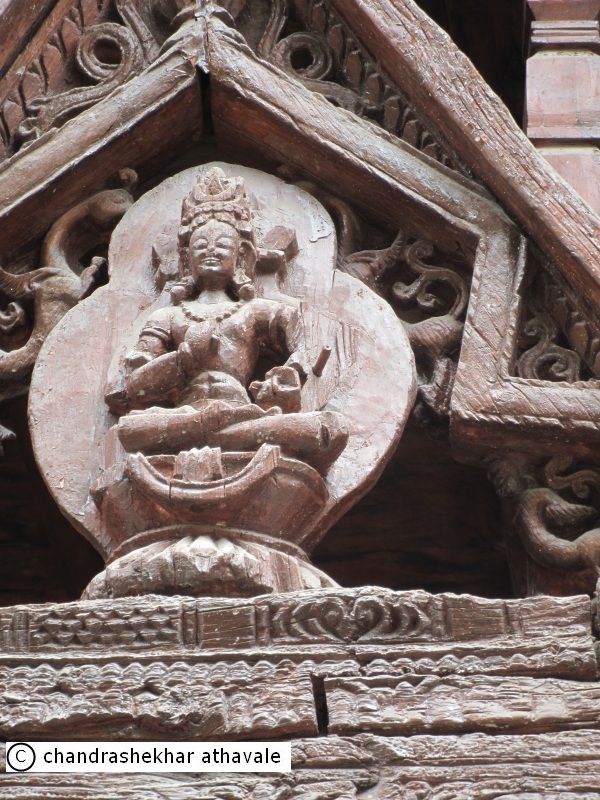 Both temple facades have carved front wooden panels with miniature Bodhisatwa figures embedded in intricate patterns. 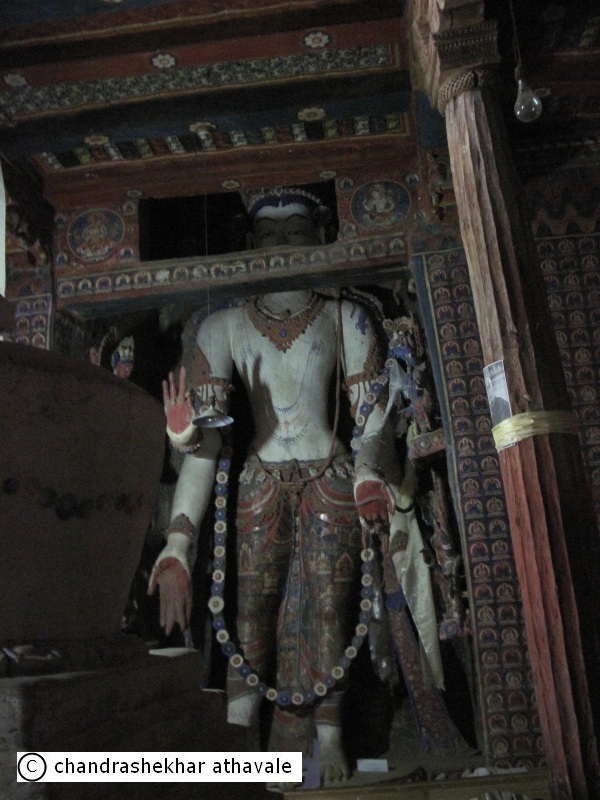 Inside the Manjushri temple, there are large plaster images of Bodhisatwa. 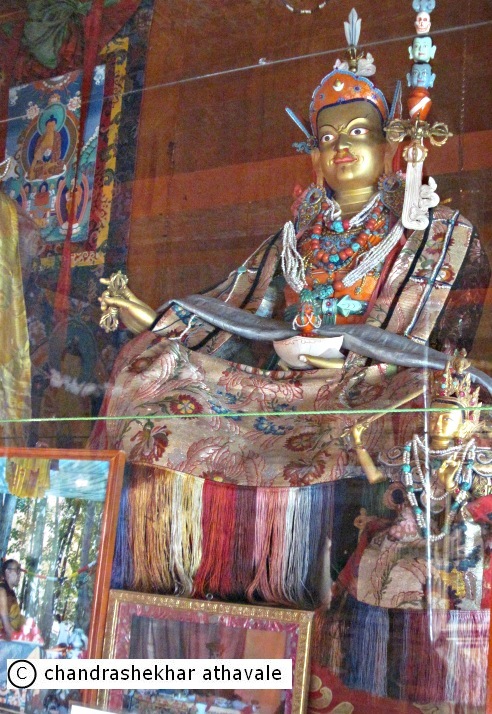 Lotsa temple is dedicated to the founder of the monastery, Rinchen Zangpo and I see a gilded statue of Bodhisatwa Shakyamuni inside the temple. Du-khang or the assembly hall could be considered as the best part of Alchi monastery complex. 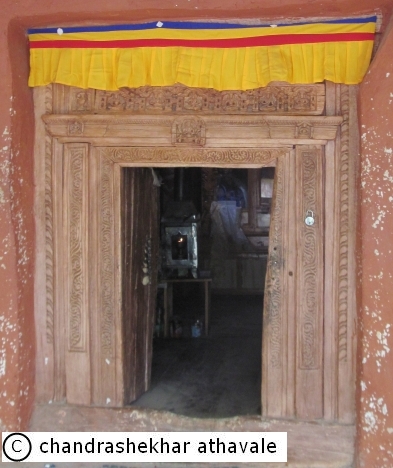 This Du-khang has a courtyard and an elaborately carved doorway. The courtyard is covered and converted into a prayer room for the monks. I walk inside the main hall. 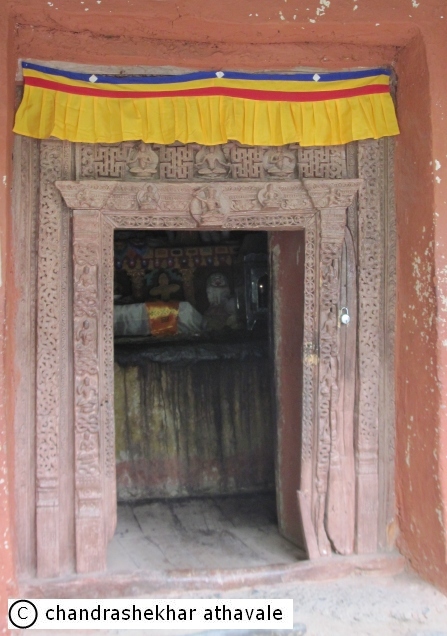 The main deity here is Vairochana, whose statue can be seen in the central recess of the wall. 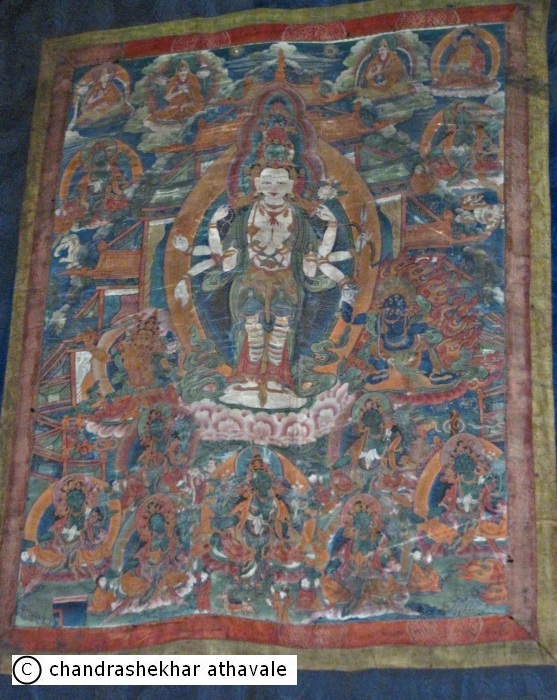 Other deities such as Ratnasambhava and Amitabha are on the sides. The walls inside are painted with thousands of tiny figures of Buddhist deities and with huge circles or mandalas filled with tiny figures of deities and other symbolic figures. I find another mural of 1000 armed Avalokitesvara, near the door way. Its a pity that photography is not allowed inside this Du-khang. I manage to take just one or two snaps with the kind permission of the Lamas. 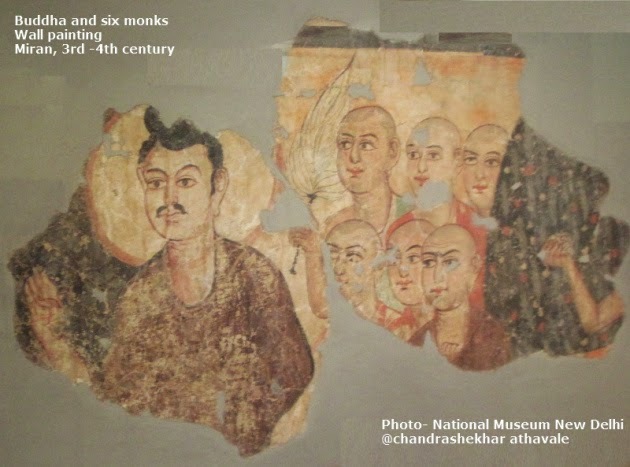 I realize that keeping these beautiful wall paintings in my memory without aid of photographs is going to be a herculean task. They have some photographs for sale. Firstly the quality is poor and secondly, the photographs are meant for religious purposes. I walk back empty handed towards the town square. I find a nice restaurant on the way. They serve excellent fruit juices but I stick to my favourite, the black Tea. We are back on the Kargil-Leh road. My watch shows that its 12-30 PM. I wonder about having lunch somewhere, but driver feels that we should instead turn left on a branch road and proceed to our next destination, the Likir Monastery, about five kilometers away. He adds further that even though this monastery is located in a remote gorge of Ladakh range of mountains besides an old caravan route to Leh, there is a reasonably good restaurant there. We take up his suggestion and take the branch road. The road is not in very healthy condition, thanks to the heavy floods of summer in 2010. The authorities have managed to repair the major roads so far, yet smaller roads still remain in bad condition. The Likir monastery occupies a secluded site on a steep hill. 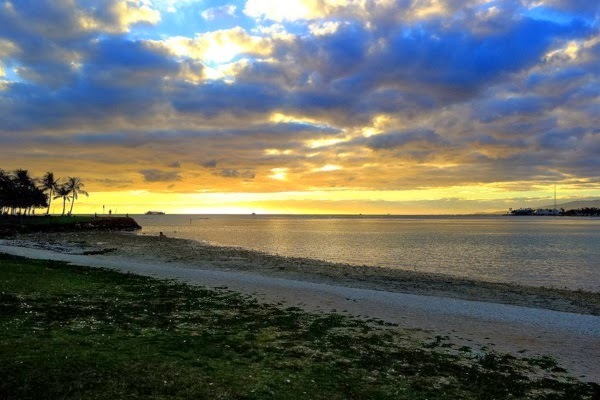 The land scape around is however simply breathtaking. With a tall range of snow capped mountain ranges just behind, the monastery is surrounded by lush green agricultural fields on all other sides. 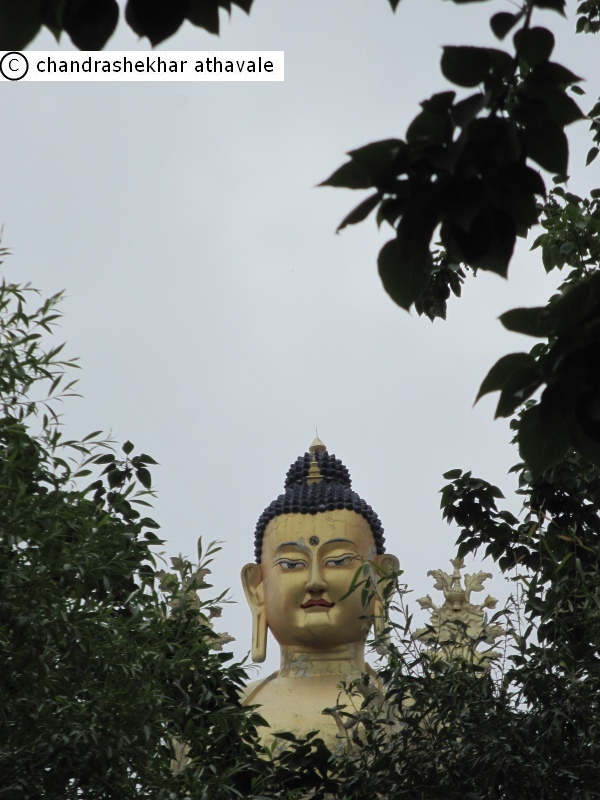 A 75 feet tall statue of Maitreya or the future Buddha, built in 1997, on a side of the monastery, adds to the majesty of the view. This monastery belongs to the Gelugs-pa order of the Mahayan Buddhism. The car stops at the parking place. I get down, pick up my camera and start walking up the hill. 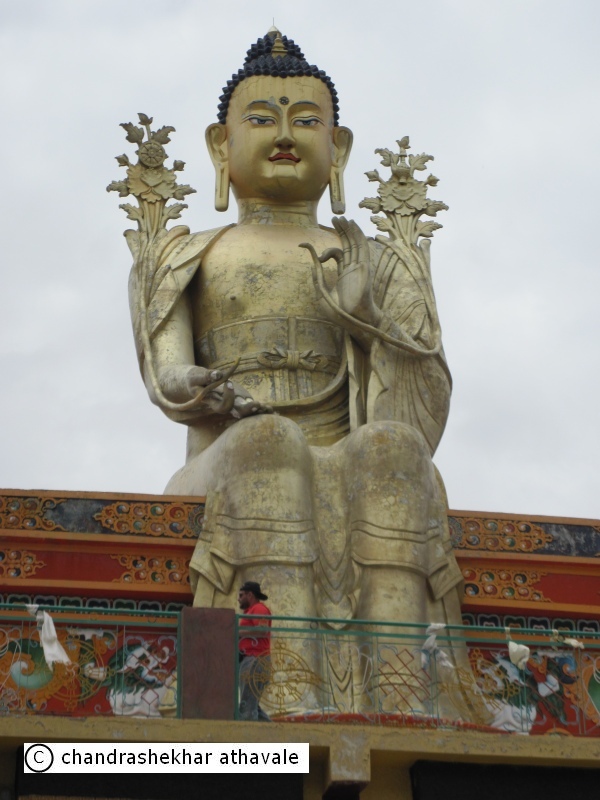 The first attraction on the way is the 75 feet statue of Maitreya. The statue, painted in bright golden yellow colour, looks quite impressive. I climb few steps on the side and reach the Du-khang or the assembly hall. A Lama welcomes me. He tells me that I would have to hurry, as the Monastery would close for lunch between 1 Pm to 2 PM. I request him to keep it open little longer after 1 PM. Surprisingly he gives his consent. The exterior walls have bright paintings of the Guardian kings of the four cardinal directions. 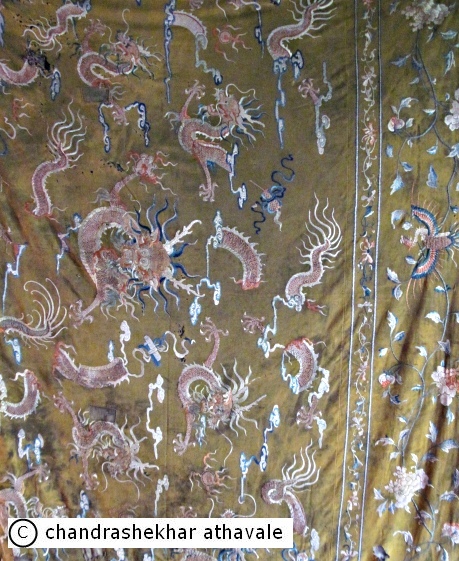 Inside the Du-khang, walls are decorated with banners or Thankas. A collection of manuscripts neatly arranged can be seen in a glass cabinet. 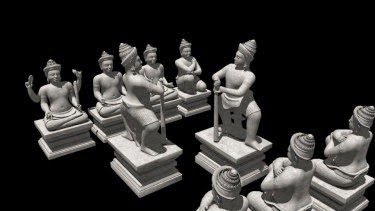 There are statues of Bodhisatwa and Amitabha, but I find these covered with fine white cloth. The highlight of the Likir manastery is however the museum. 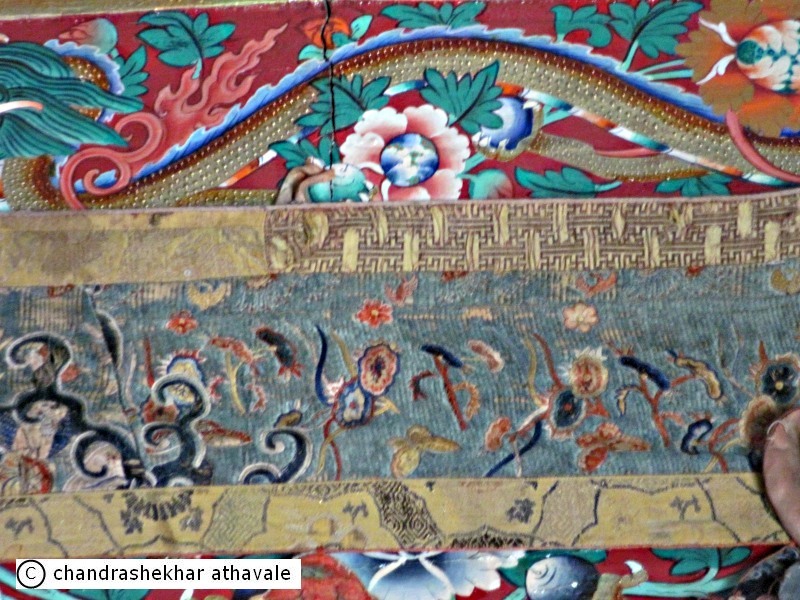 This museum has an impressive display of ancient weaponry, musical instruments, ornaments, historical documents, Ladakhi costumes, coins and centuries old ‘Thankas’ or banners and hangings, most of which are at least 800 to 900 years old. 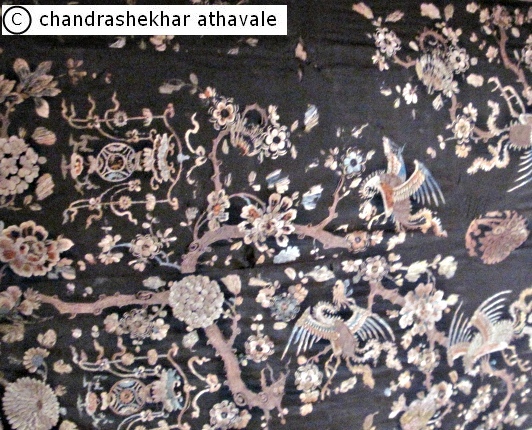 Some of the old banners embroidered on silk fabric with gold thread are just priceless. 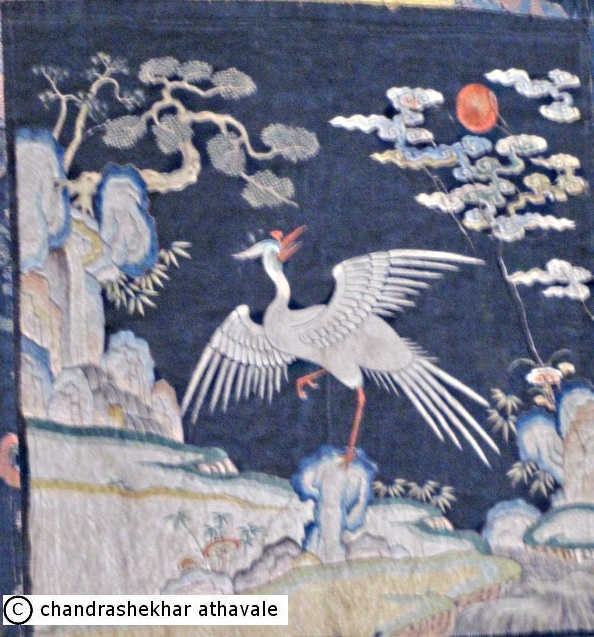 Some of the silk hangings remind me of similar wall hangings found by the great explorer Sir Aurel Stein, from Dun-huang monastery in China and now displayed in the national Museum at New Delhi. After my visit to the Likir museum, I walk to the terrace in the front. The terrace has a fantastic panoramic view of the Likir gorge and the Zanskar mountain range far ahead in southerly direction. I take few snaps of the view and enjoy the cool breeze in the hot sun. A flight of stairs, brings me down to a lower level of the monastery, where a new Du-khang is located. 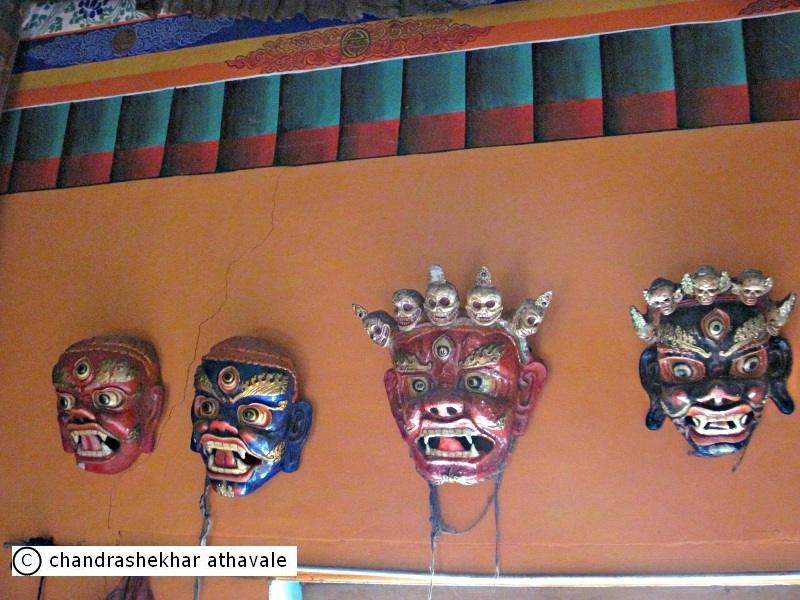 This room has a wooden Mandala of Vajra-Bhairava and impressive statues of 11 headed and 1000 armed Avlokitesvara and few other deities. I look at my watch. It is already 1.30 PM. I remember that the kind Lama of Likir monastery, had forgone his lunch recess and kept the Du-khang open for me. I sincerely thank him and start walking down the hill. I try a Ladakhi gourmet dish for my lunch. Noodles with Thukpa soup. The dish, made from Noodles and a soup consisting of peas, dried cheese and leafy vegetables, turns out to be very testy. We are back now on Leh-Kargil Road. Afternoon is very warm. The sun light burns anyone here very easily. This is because of the rarefied atmosphere of the high altitudes, which can not block the ultra-violet radiation of the sun. I am lucky that I am wearing a full sleeve sweater, otherwise Sun block cream is a must. Our planned next stop is the Basgo fort ruins. 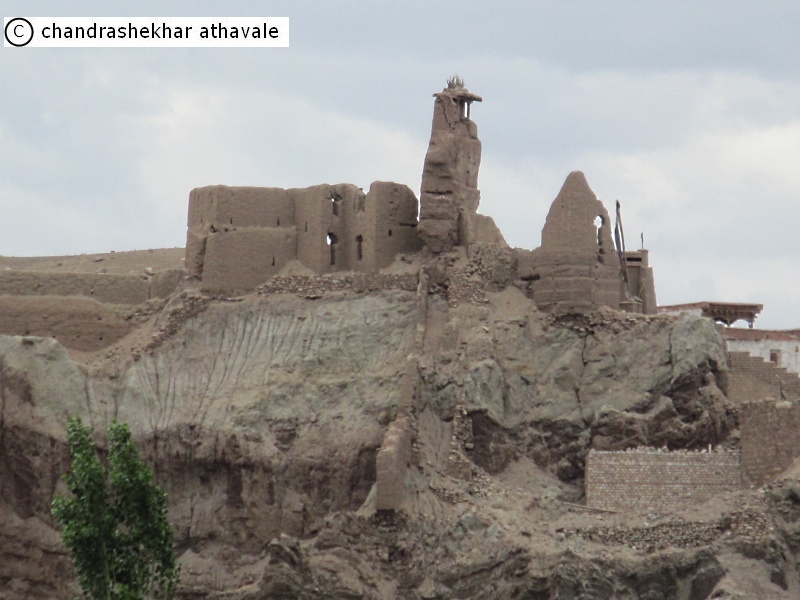 This fort, being the residence of Ladakhi kings,is historically a significant place. In 1683, Fifth Dalai Lama of Tibet, sent an army to Ladakh over a religious conflict. 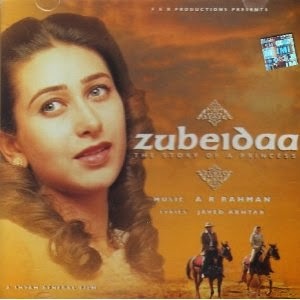 The then Ladakhi king, sought the help of Aurangzeb, the then Mughal ruler of Kashmir and India. In a battle that followed, Tibetan forces were defeated and a treaty was signed between Ladakh, Mughals and Tibet. Unfortunately, my enthusiasm to visit the ruins is nipped in the bud. 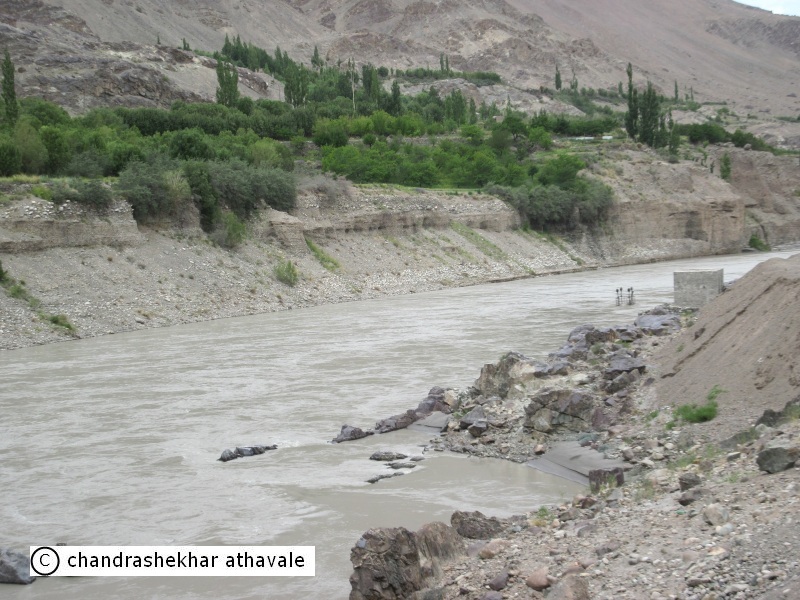 In 2010 floods, the road, which leads to the fort ruins, had been breached. This means that the car would not be able to go up. I would have to climb up a significant distance. This is just not possible today, because we are already running behind schedule. I realize that if we had started early from Lamayuru, as per our schedule, we had time for this sight seeing. Because of the late start, I would have to just miss this sight. My resolve to dump this driver, who was the main reason of this delay and who must have been in the knowledge of this situation, is strengthened further. We are back on Kargil-Leh road. Our next stop is Gurudwara Pathar Sahib. This place, situated about 25 miles from Leh, is a shrine created from a huge stone boulder and a legend by the Indian Army. The stone has a peculiar depression, which looks like the profile of Sikh Guru Nanak as shown in his pictures. There is a legend that a demon tried to kill Guru Nanak of the Sikhs, by rolling down this boulder on him when he was mediating here, while visiting Ladakh and Tibet. 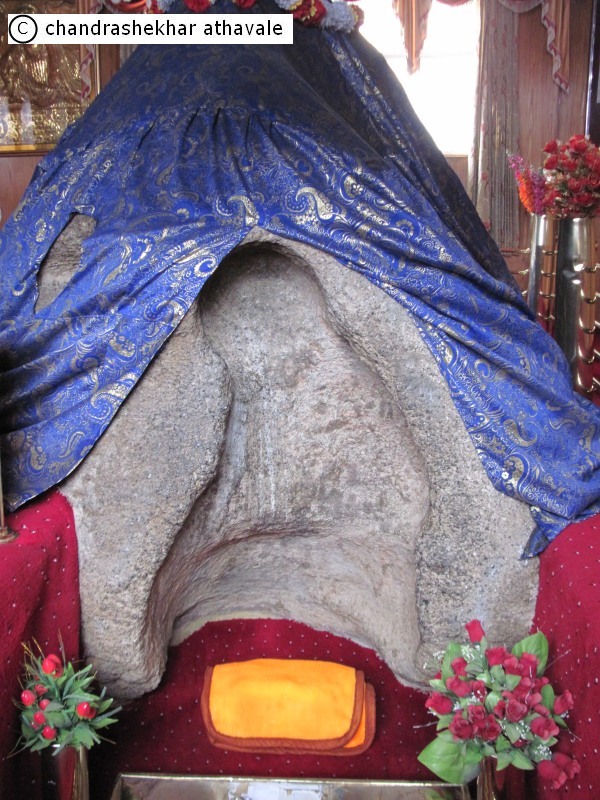 The boulder turned into wax and Guru Nanak’s impression was etched permanently on the stone. A Gurudwara was built by Buddhist Lamas here in 1517. The small Gurudwara, has now been converted into a big shrine by the Indian Army, since it took over maintenance of this place in 1948. The Gurudwara is just on the curb of the Kargil-Leh road. I get down from the car and get inside a shamiyana ( a large tent). I remove my shoes, wash my hands and feet and visit the Pathar Sahib. One has to sit with his legs folded together and then keep his forehead on the ground to pay respects. After the visit, I sit down on the carpet and talk to number of Army men, who have come here to pay respects. I receive a small quantity of Sweetened rice flakes and cool water to drink. As I talk with these Army Soldiers, I realize the power of faith over we human beings. This place is so revered and honoured by our soldiers, that each and every man, who is posted in Ladakh, comes here, before joining his duty, to pay respect and after successful completion of his tenure, never forgets to visit the shrine again before heading home. The army men firmly believe that Pathar sahib would see them through this toughest assignment of their army career. 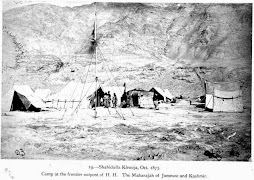 Indian Army, realizing that every soldier, who is posted here, has that little bit of fear and uncertainty in his mind, has cultivated and nourished this object of faith, which helps in giving the soldiers, supreme confidence needed, before they join their duty in Ladakh. 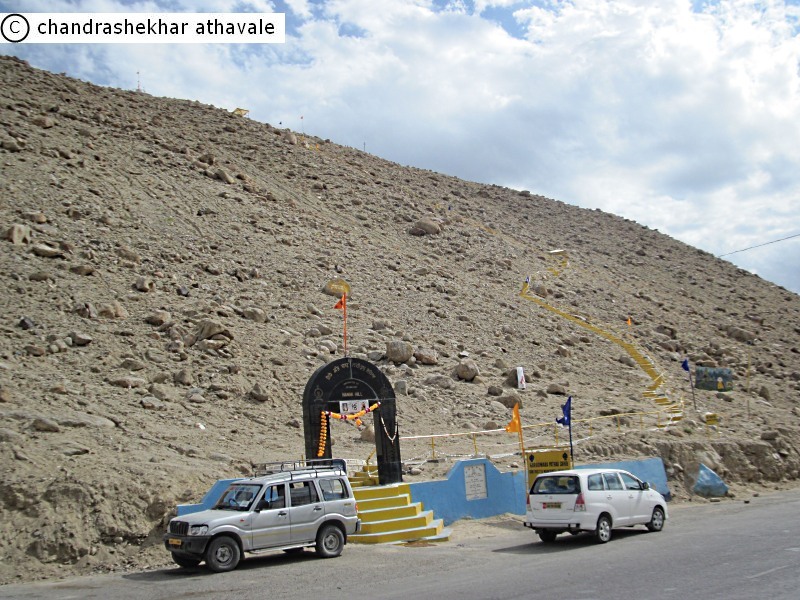 On the other side of the Kargil-Leh road just opposite Pathar Saheb, a medium sized hill with rocks and stones strewn all over, is named as Nanak hill. A path of stairs has been built to the top. I just look at it, imagine in my mind the height and give up all thoughts of climbing it. As we near Leh town, I look at my watch again it is almost 4.30 PM . We still have one more place to visit. I ask our driver. He tells me in a a nonchalant tone that ‘The hall of fame’, the place which we are supposed to visit, closes down at 5 PM. Its is a big museum and needs time to visit. I am so mad at the driver that I have no words to say. This idiotic fellow, has seen to it that we would miss two interesting sights so that he can reach Leh before evening and can go home early. The car drops me at the hotel. 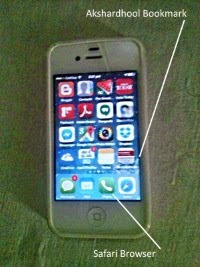 I telephone the travel agent and tell him about what has happened. He tries to pacify me and says that he would visit me late in the evening to sort out the matter. After my trip in the rural districts, town comforts of Leh are very soothing to mind and body. I have some nice and hot Tea, relax, take a bath and decide to go to Leh market, which is not very far off. Leh is a big town, fairly wide spread. In a typical Indian Bazaar style, all the shops that are of interest to tourists, are located in an area known as old market, a complex of few odd lanes and couple of main roads. There are shops which sell clothes, curios, food, books, bags and almost anything that a tourist may require. I am told that State Bank of India has a n ATM machine there. I locate it but find a long queue in front of it and decide to defer it’s use to a later date.As I move around this ancient market, I remember something that I had read in a book sometime back. Leh was an important trading town at least for last two to three thousand years as a direct trading route linking it to Yarkand and subsequently with Kashgar, in China, the places which have always been on the Silk route. Trade caravans had been traveling on this route for at least last 3000 years. The goods that were commonly traded on this route, included items like wool, silk and silk cloth, Russian leather, Spices, salt, Gems, Gold dust, felt and Tea. I feel nice to move around the same historic market, where for three thousand years, trade boomed between India and the central Asia. This trade has now come to a complete halt since last 60 years, because Chinese have sealed the border pass. I can only hope that Chinese would see the trade potential here and lift the trading ban. Leh has the potential to become a big ‘in land’ trading port of India. It is almost 7 PM , when I return to the hotel. My Travel Agent is waiting for me. He tells me that he is sorry about the driver and I would be getting a new driver from tomorrow. About Hall of Fame, he promises that he would accommodate a visit in our program, on a suitable later day. Satisfied with the arrangement, I am feeling quite happy. I have an early dinner and hit my bed. Tomorrow we leave for Nubra valley.